When the horror bug bit me as a kid, I made it my mission then and there, to consume everything I could get my hands on. I distinctly remember those films that cemented my love for all things macabre. And one of them was the 1986 cult classic Critters. Critters tells the story of a race of small, furry extraterrestrials who escape from a prison ship and find themselves stuck on Earth. The aliens or “Crites” as they’re known, immediately begin wreaking havoc and eating everything and everyone in sight. The Crites are pursued by two intergalactic bounty hunters, who can take on the physical appearance of whomever they want. Will the bounty hunters be able to stop the Crites and save the Brown family, who have found themselves under siege by the man-eating creatures? The original was followed up with 3 sequels and just recently a small screen adaptation. 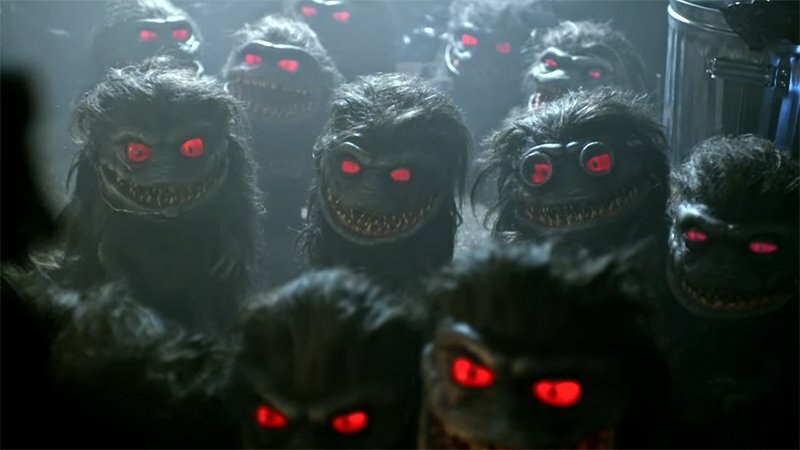 Critters: A New Binge is a new, 8 episode series, that just premiered on the horror streaming service Shudder. But is it any good? The answer is two fold: Yes and no. As a fan of the Critters series, I was stoked to hear that the fluffy and loveable man eating aliens would be returning once again. As I settled in to watch, I realized that the run time for each “episode” ran between 9-10 minutes. Critters: A New Binge, directed by Jordan Rubin, tells the story of Chris, a young, awkward teenager. Chris lives in the exciting town of Livingston, Iowa with his friend Charlie, and his mom Veronica. Chris also pines after a girl named Dana while trying to balance his insatiable appetite. Chris and the gang suddenly find themselves in the middle of a Crite invasion. The Crites have returned to Earth on a secret mission to find one of their missing comrades. With a set of bounty hunters on their trail, Earth is once again primed for a showdown between the Crites and the bounty hunters. While I appreciate this new entry into the Critters universe, for me, it misses the mark. But the show does have some redeeming qualities. One of those qualities is the humor. The slapstick style goofy jokes don’t always land, but when they do, they are hilarious. I found myself chuckling several times during conversations between the Crites as they discuss how Earth has changed since the 1980’s. Another nice surprise to come out of the show is the practical effects. The new batch of Crites look exceptionally well done. Several of the Crites have distinct outfits, personalities, and facial expressions which make you more vested in that specific character. Some of the Crites are just as much main characters as Chris and his friends are. So where does Critters: A New Binge fall short? For me, it does so in several areas. The special effects, aside from the puppet crites, are abysmal. Several of the shots look like they were done in a high school film editing class. I am not normally one to be harsh on FX work but this was so bad I couldn’t help but zero in on it. The storyline of the series begins well enough, but halfway through, it goes completely off the rails into the absurd. For those who still have not seen it, I will try to make this section as spoiler free as possible. For those who have seen it, I am sure you know where I am headed with this. When the Crites mission and the circumstances of said mission are revealed, I actually said “Are you kidding me?” out loud. While small, furry, man eating alien balls from outer space is not necessarily a standard trope in entertainment, the plot twist makes it even more ridiculous than the above description. I was also not a fan of the running time of each episode. As you begin watching the episodes you find yourself getting into the story and then suddenly it’s over and on to the next one. I would like to have seen each episode fleshed out into something longer. In the end it might have been better to make the story a little lengthier and churn out a 90 minute Critters sequel instead of a 70 minute, 8 part series. Critters: A New Binge ends with the possibility of the series continuing via a cliffhanger ending. If the show does return, I hope future episodes will be a vast improvement over what we got. In the end, Critters: A New Binge just doesn’t live up to the hype or expectations. Save yourself the trouble and just re-watch the first 2 Critters films.